We’d love your help. Let us know what’s wrong with this preview of The Crimson Gate by Whitney A. Miller. Harlow Wintergreen has just been named the new Matriarch of VisionCrest, the powerful religious organization previously led by her father. But there's one big problem. The real Harlow is trapped inside a Cambodian temple, and her double, the evil Isiris, has escaped confinement and is masquer Harlow must stop her evil counterpart in this thrilling sequel to The Violet Hour. 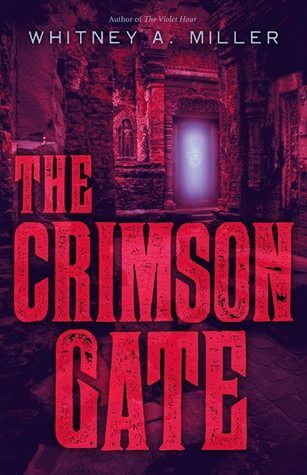 To ask other readers questions about The Crimson Gate, please sign up. In an inventive weaving of "before" and "after" narratives, Miller solves the conundrum of moving the sequel forward immediately after imprisoning her protagonist at the end of The Violet Hour. The VisionCrest apocalypse is nigh, the virus has been loosed on humanity, and civilization is en route to extinction. Only Harlow Wintergreen, whose identity has been usurped by the goddess Isiris, can reverse the damage her doppelganger has wrought across the globe. A new character, Parker, is introduce In an inventive weaving of "before" and "after" narratives, Miller solves the conundrum of moving the sequel forward immediately after imprisoning her protagonist at the end of The Violet Hour. The VisionCrest apocalypse is nigh, the virus has been loosed on humanity, and civilization is en route to extinction. Only Harlow Wintergreen, whose identity has been usurped by the goddess Isiris, can reverse the damage her doppelganger has wrought across the globe. A new character, Parker, is introduced early on, whose trustworthiness is suspect and who yet is Harlow's only link to the world that's devolved so severely since the events of the last book. Together, they make new friends and meet up with familiar members of the Resistance. The action is riveting, and the consequences for humanity for accepting the false deity grow ever more grotesque as the novel progresses. Miller answers some questions regarding the mythology of the world she's created (most strikingly, what is the guardian in the temple actually doing with all those wraiths going through doors?) even as she raises others. This progression feels natural and brings the reader further into her world readily. Information is revealed appropriately, and the switch between "before" and "after" perspectives brings a real focus and momentum to the narrative without feeling like things are inappropriately concealed from the reader. The resolution is gory in a way that fits the dystopian horror genre well. Harlow's characterization was inconsistent at times (e.g., there was an awful lot of "like" being thrown around on the train ride that wasn't said before or after in the book); and she seemed surprisingly, single-mindedly devoted to Adam in a way that felt more told than shown at times. It was hard for me to imagine why she remained so attached to him after his betrayal in the first book, her determination not to become like Isiris leads her into "lawful stupid" territory instead of being simply lawful good, and Isiris espouses more of a Blofeld-style of evil than a seductively sinister and complex villainy, but these are also consistent with the YA orientation of this book. Quick & Dirty: A girl and something? A love square and a cult! The Crimson Gate picks up right after The Violet Hour ends, so on that note I would suggest you pick up the first book before reading The Crimson Gate. Otherwise, you will have no clue what is going on. Harlow was just a girl who heard voices, it turns out that voice was Isiris who is like a goddess, maybe, still unsure, but she is also a dead ringer for Harlow. So Isiris leaves Harlow trapped in the temple and takes Harlow’s place. Isiris then plans to destroy the world and kill everyone and it is up to Harlow to stop her. Harlow begins to work with Hayes and the Resistance to beat Isiris. Harlow shared a kiss with Hayes in book despite her love for Adam, hence why I said love square because in the Crimson Gate, Adam is with Isiris and Harlow is sort of with Hayes. It’s all a little confusing. I wanted to really like this book, but I found the first book confusing. This one wasn’t much better. A lot of interesting elements but no real clarity on what is going on, for example is Isiris a goddess or does she just have some kind of magic? Harlow gets a taste of this power in the book but why does she have Isiris’ power? Just more questions raised than are ever answered. Plus, the love square, although I did like Hayes quite a bit more than Adam, and by the end of this book I firmly wasn’t in the Adam camp. I am not sure why Isiris and Harlow looked so much alike either, Harlow referred to her as her doppelganger and the synopsis refers to them as twins, but that is never really explained. I think I would have enjoyed these books if everything was a lot clearer. If the world building was better and I could understand what was going on. 'The Crimson Gate' is an exciting sequel in a gripping young adult science fiction/dystopian series. It continues to follow our main character - Harlow - as she attempts to find and stop her evil twin before she wreaks chaos on the world. Harlow's double, Isiris, is acting as Harlow and was just named the Matriarch of VisionCrest - a very powerful religious group that her father had led. Isiris is taking advantage of her new position within the organization and plans to unleash a supervirus that 'The Crimson Gate' is an exciting sequel in a gripping young adult science fiction/dystopian series. It continues to follow our main character - Harlow - as she attempts to find and stop her evil twin before she wreaks chaos on the world. Harlow's double, Isiris, is acting as Harlow and was just named the Matriarch of VisionCrest - a very powerful religious group that her father had led. Isiris is taking advantage of her new position within the organization and plans to unleash a supervirus that will kill all the members of VisionCrest and erase all traces of the group's existence. Harlow must find a way to escape the temple she's being held captive in, and then she has to find the Resistance - all before Isiris' plans are acted out. Just like the first book in the series, this installment was a phenomenal mix of several different genres, specifically dystopias and thrillers. The plot picks up pretty much where the first book stopped, which made it easier for me to fall back inside the world the author created and to experience the story alongside Harlow. The story continued to be very original and hard to describe. Harlow continues to be a fantastic main character, even with her obvious flaws, but she also is a devoted friend and daughter who will fight for what she believes in and will do whatever it takes to make everything right. She's very smart, strong - both emotionally and physically, and she's willing to risk her own life for everyone - from the people of VisionCrest to the general population of her land. I found the rest of the characters to be well written, if not a bit predictable at times. Isiris proves to be a worthy adversary with strength, intelligence, and a plan of her own. Aside from these small predictabilities, the rest of the story was well written with tons of suspense and twists, which will keep readers on their toes. The author wrote with great attention to detail, vivid imagery, and a fast pace, which kept me eagerly reading to see what was going to happen next. Overall, this was a unique and fascinating sequel that fans of several genres will enjoy getting their hands on - highly recommended! This review has been hidden because it contains spoilers. To view it, click here. Miller really has potential! The world building is pretty fantastic, and the international setting is unique. That said, there are some plot holes and inconsistencies. My main question is: Why? What is the motivation behind the evil and destruction? I know that lots of YA dystopian-type novels don't answer the why question, but that always makes me like those novels less, and this is no exception. I also felt like the quickly wrapped-up ending could have been a third book. I would have read it b Miller really has potential! The world building is pretty fantastic, and the international setting is unique. That said, there are some plot holes and inconsistencies. My main question is: Why? What is the motivation behind the evil and destruction? I know that lots of YA dystopian-type novels don't answer the why question, but that always makes me like those novels less, and this is no exception. I also felt like the quickly wrapped-up ending could have been a third book. I would have read it because I had grown attached to the characters and I enjoy the settings. SPOILER ALERT!!! I would have liked to read more about Dora and Parker's relationship, and about how Harlow got the remaining people of Earth to trust her. SPOILER ALERT OVER. Crimson Gate was not, in my opinion, as gory and scary as its predecessor. And I'm ok with that. The Violet Hour had more eye cutting than any book really needs. It's both off-putting and fascinating in a weird way. Maybe I have just become desensitized to it. Violet hour definitely gave me nightmares, while Crimson Gate did not. Finally, the punk references either need to be fleshed out or removed. Whitney A. Miller lives in San Francisco with her husband and a struggling houseplant. She's summited Mt. Kilimanjaro, ridden the Trans-Siberian rails, bicycled through Vietnam, done the splits on the Great Wall of China, and evaded the boat police in Venice, but her best international adventures take place on the page!